A quiet spot to relax in the village hall garden. Big turnout at the village hall to hear whether we had won the Floral Gateway Champions of Champions Competition. Sadly we hadn’t. The town with input from shops, businesses and horticultural Department of the local university campus won. Their floral display was stunning but then they had a much larger budget than we did. The rest of us were awarded highly commended certificates. For a wee village with around a hundred people we produced a show to be proud of. 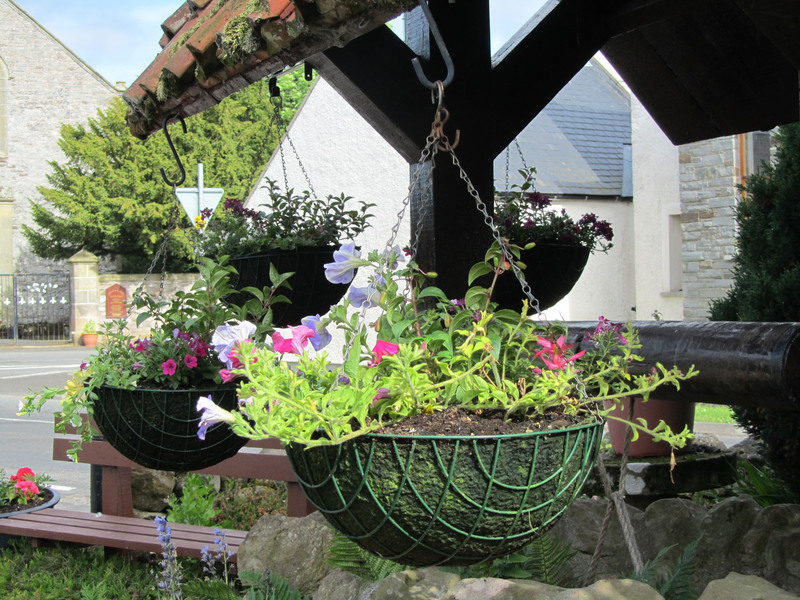 And plants and shrubs will bloom here in our village long after the bright bedding plants in the winning town’s hanging baskets, window boxes and planters have wilted and died. The old well at the centre of the village. So as we ate our stovies, followed by a tempting array of puddings, we bought raffle tickets and forked out for other fundraisers to finance a better display for next year. Village children were out in force, faces painted, helping out and enjoying themselves. It’s so wonderful to stay in a place where vandalism is rarely experienced. In the past we stayed near a small town where floral displays were regularly destroyed, not always by youngsters but sometimes by older people who fancied the plants for their own gardens and reckoned they had paid for them though their rates so were entitled to take them. Difficult to understand the attitude, but unfortunately it exists, and the planters instead sprout empty cans, plastic bottles and assorted litter. 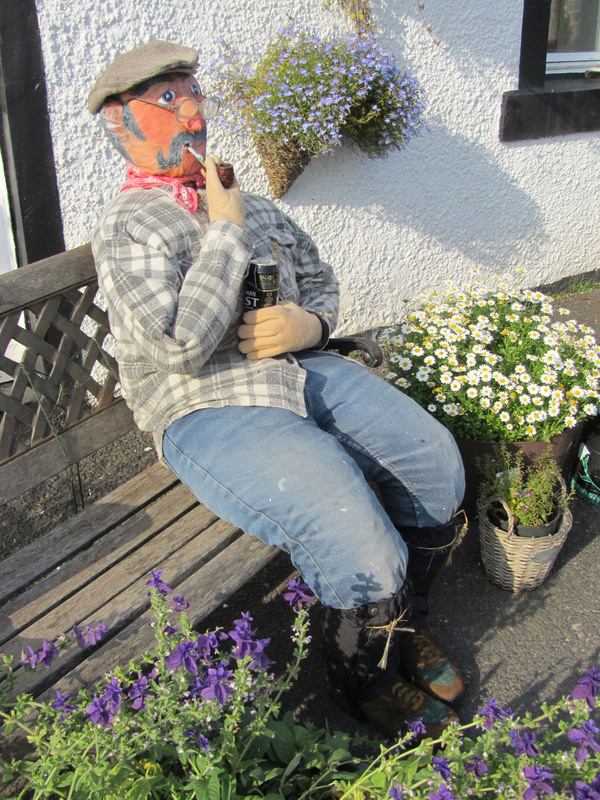 Our village’s most recent resident who put in an appearance in time for the Floral Gateway judging day. How did the judges resist his charms! He has been sitting outside the pub ever since and on wet days sports a snazzy black and white umbrella. But in this little corner of the Scottish Borders our flower beds and tubs still look good and our hopes are high for the challenge next year. This entry was posted in The environment and tagged Floral Gateway competition, In the Wake of the Coup, plants, Scottish Borders. Bookmark the permalink. Lovely. Fun that the village will be reaping the rewards of their hard work for sometime to come! I loved this entry; somehow I was transported to a timeless place. But what are stovies? I guess rural areas are slower to move with the times and like to retain some of their past. Stovies? Other are asking that so tune into my next post when all will be revealed. Sounds like a wonderful community with lots of community spirit. I don’t know what stoves are either. I meant to say ‘stovies’. I would hope I know what a stove is. Small villages (we are officially classed as remote yet only 30 minutes from the ring road around Edinburgh) tend to retain much of their community spirit. It’s what attracts many people to live here. The local school, in danger of being closed on several occasions because numbers had dropped into single figures, now had over 40 kids. All mine went there and got a great, and wide-ranging, education. As for stovies, I’m going to do a post on them – soon (hopefully!). When I looked up the census for 2001 the population was given as 60. The 100 is an estimate (fairly accurate) and the results of the 2011 census are not yet available. That is the number of people who actually live in the village, but like all rural areas there are lots of people round about and in surrounding farms. But yes, it’s a small village – amazing what it achieves though.